Google’s slick new header for giving. Click on the “donate now” button and you’ll see a super easy-to-use form. All of this is great. Unless you start to realize that this means your online giving page(s) and functionality will be compared to Google’s. That’s tough because it’s not a fair fight (you don’t have thousands of developers building your tools for you, do you?). But, you’re going to need to deal with this. If you use Google Wallet, this is a one-click gift form. If not, you bump to Network for Good and it’s a little clunkier. 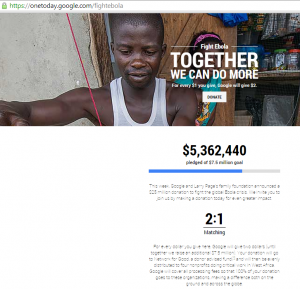 Every dollar given to Google is likely from donors’ disposable income, which is finite. If your organization doesn’t get out in front of efforts like this, you’ll be more likely to hear “I already gave…”. So, take this as a clarion call. If you want your donors’ experiences with your online giving to compare to their consumer experiences, you likely need to adapt. As the holidays approach, be sure that you are ready and that your online giving tools are spruced up and ready to go. Google is ready if you’re not. During the St. Louis Planned Giving Council meetings, we spent some time discussing the challenges (and, as some call it, strangle hold) that cost-per-dollar-raised measures place on great fundraising. The “overhead myth” approach aligns nicely with the notion that we are under-investing in our fundraising efforts. We emphasize efficiency over effectiveness and often miss out altogether on the notion of impact and net gains. We can start to change this. Of course, some donors would like us to do more with less. However, donors that are focused on the long-term impact of their giving understand the value of investing in broad gains, much of which requires patience. Have a look at this Prezi on the topic: Funding Fundraising Ideas from Chris Cannon. And, let me know what messages, metrics, and strategies are helping your team invest more and more strategically. The St. Louis Planned Giving Council was a terrific setting to discuss changes (and continuations) in prospect development. The group discussed what’s the same, what’s new, what’s working and what’s on the horizon. You can find my presentation on the topic here: SLPGC – Prospecting Discussion, November 2014. Best of luck with your fundraising initiatives as year end approaches.